LAST MONTH, I spent a rainy day in Tijuana with a group of mostly Central American and Haitian migrants as they awaited transportation across the US border and into immigration detention. My presence that day was part of the “Sanctuary Caravan,” organized by the New Sanctuary Coalition (NSC). As part of an effort called “Forty Days and Forty Nights at the Border,” the organization recruited and trained hundreds of volunteers from around the country to come to San Diego and Tijuana from mid-December to the end of January. We were variously dispatched to the NSC’s legal clinics; to other established organizations such as Border Angels, World Central Kitchen, and Al Otro Lado; and to the border, to do the core NSC work of accompaniment. Accompaniment is the New Sanctuary Movement’s practice of escorting migrants and standing with them during their encounters with state power. Around the country, organizers assemble documented people to show up at immigration, civil, and criminal courts, and to ICE check-ins, petitions, and hearings. Accompaniment bears witness to the injustices of immigration enforcement; it also suggests to the Department of Homeland Security (DHS) and other state personnel that migrants are not isolated, but are part of a broader community. The practice forges bonds between people like me, who have passports that allow us across the border at El Chapparal, the Tijuana port of entry, and the thousands of people arriving at the border who lack such documents and access. At the volunteer training in San Diego, we were cautioned not to take pictures of any of the asylum-seekers, because some are pursued north by the dangers that compelled them to flee their home countries in the first place. But I have mental images of that wet and chilly day: the teen couple who considered whether to get married as we sheltered under a highway bridge, in the hopes it would allow them to better keep track of each other. The two-year-old in the big donated white puffy coat who eventually took a nap in her mother’s arms—her mother held her the entire two hours, leaning against a parked car. The young woman who frantically dialed a friend on my cell phone as she walked towards the transport bus, leaving messages in Creole. And a young man traveling alone who smiled in the rain and gave me a thumbs up as he climbed aboard, waving through the grilled windows as the bus pulled away. 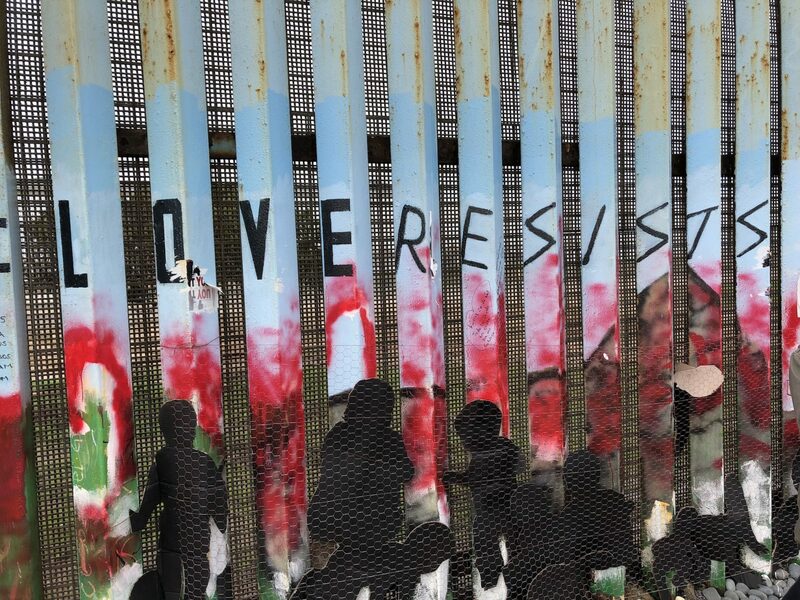 As the activist scholar Melanie Kaye/Kantrowitz once wrote, “Solidarity is the political version of love.” Rooted in solidarity, accompaniment spans borders and states, countering the DHS’ division of people as “documented” and “undocumented” by reinforcing collective connections. The caravans themselves emerge out of practices of solidarity and accompaniment, with Central Americans, Haitians, Africans and Europeans walking overland together, seeking asylum. Mexican migrant advocate Irma Garrido, of the organization Reactiva Tijuana, describes the “communal rights perspective” of the caravan as a grassroots practice of solidarity based in Central American popular movements. The New Sanctuary Movement refers to caravans of asylum-seekers as an “Exodus”; such biblical metaphors are common currency in the movement. Like its most recent predecessor in the United States, the Sanctuary Movement of the 1980s, the current “New Sanctuary” movement draws on the moral power of religious teaching to oppose the depredations of a militarized border. What the campesinos are doing is only just, and you should always be at their side. What the National Guard is likely to do is unjust. If they attack, you should be there next to the campesinos. Accompany them. Take the same risks they do. In the ’80s, the North American organization Witness for Peace sent citizen observers to monitor human rights violations in Central America and Haiti, and their delegations began to accompany migrants as they fled civil war and repression in these countries. Observers and Central American asylum-seekers imported practices like accompaniment back to faith communities in the United States, who began to implement them in this country. Practicing accompaniment that day at the border, ten to 15 volunteers stood with about 40 migrants who had been notified that it was their turn to cross. Under the illegal metering system that has developed at the border, asylum-seekers are denied the right to enter the United States and initiate their cases to prove the “credible fear” stipulated by US policy. Instead, they are detained in ports of entry like Tijuana while they await word that they have been allowed to cross. Waiting in the rain with us that day in Tijuana was a family group containing a lesbian couple, their children, and some older relatives: parents and uncles. Advocates interceded with Mexican authorities to urge that this group be kept together. The advocates gained some traction and the group crossed together, although their fate at the hands of the US Customs and Border Patrol Agency (CPB) on the other side of the border remains unclear. Because DHS has not maintained careful records, organizations like Al Otro Lado try to keep track of people entering detention, so that family members can find one and other after they are released. Many of the accompaniment volunteers kept sharpies in their pockets so that people could write their names and cell phone numbers on their children’s arms. Just before everyone boarded the buses, I wrote my cell phone number on a couple of business cards I happened to have in my purse and handed them to a few of the people I had managed to connect with, despite my lousy Spanish and non-existent Creole. The people I gave them to thanked me, smiled, and tucked the cards into their pockets. I felt a little uncertain about this, as it wasn’t something we were told to do in our training, though it turned out that other volunteers were doing the same. One of the goals of the New Sanctuary Coalition is to create a national network of post-detention support in the United States—an important yet daunting project, in light of the ways the detention system takes people in at one location and often spits them out thousands of miles away. Such a network would extend the practice of accompaniment to reconnect asylum-seekers with support on the US side, but it is not yet clear what that would look like. At the time of this writing, the asylum seekers I met that day are likely stuck in for-profit detention sites across the United States. There, they are likely to be separated from some or all of their family members, and detained in crowded cells kept so chilly they are known as hieleras, or iceboxes. A National Immigration Law Center suit filed in 2016 attests to the lack of sanitation, nutrition, and medical care available in immigration detention. Stripped of warm outerwear along with most of their possessions, people kept in these conditions often get sick, many of them having arrived in poor health after walking long distances and living outdoors for months. As the bus vanished across the border in the rain, it occurred to me that when people had their possessions taken away in detention, they would in all likelihood lose my card as well. At that moment, the work of accompaniment felt frail and fallible, a mere human gesture against the militarized forces amassed against us. A new caravan of thousands of asylum seekers has assembled in Chiapas, Mexico. One name they have selected for themselves is Guardianas del Exilo: Guardians of the Exile. Along with the caravans that precede them, these migrants inherit practices of accompaniment, solidarity, and survival developed over decades in their home countries. They import these practices with them in their journeys north, practices which are useful to all of us in this cruel and dangerous time. Rachel Ida Buff is a writer and history professor living in Milwaukee, Wisconsin.